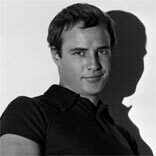 Brando was and always will be the greatest. He would transform into every character he played. And he did it better than any another method actor before and after his reign as Hollywood's leading man. Even in stills, you can immediately sense all there is to know about his characters. About his angers, his attitudes, his vulnerabilities. That's why we can feel sympathetic toward a character like Stanley in Streetcar Named Desire. And why we can hate him at the same time. He has set the bar for all actors everywhere. The best they can do is imitate.